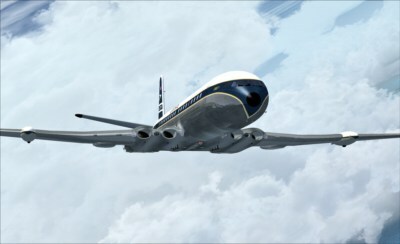 CaptainSim has released expansion packs to the Boeing 707 for FSX. More information can be found at CaptainSim. to introduce the 707 Captain family of expansions for FSX." 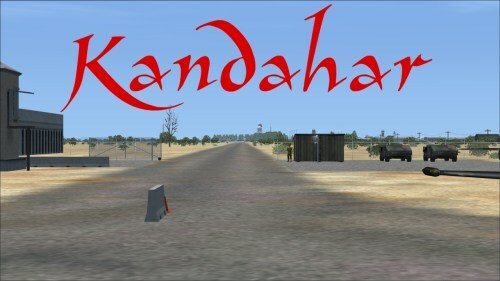 Dan Mesmer has released Kandahar Airfield v1 and Bagram AFB v3 for FSX. More Information at Mutley's Hangar. 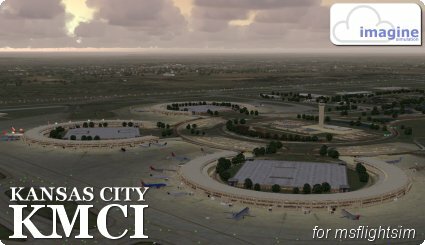 "Ready today is a much improved FSX version of KMCI Kansas City Intl. Aside from the visual improvements, the whole airport operates much more smoothly and efficiently as a consequence of a big code clean-up effort. 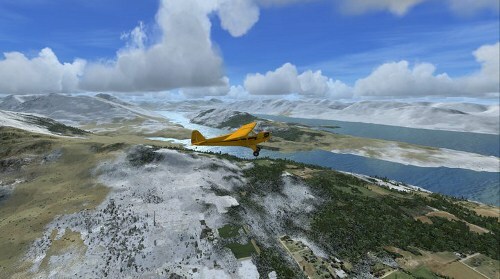 The update is free to current FSX KMCI owners." More information. 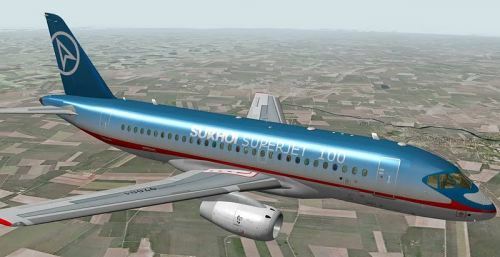 Ramzzess has released version 5 of his Sukhoi 100 Superjet for X-Plane. More information and purchase here. - Controls weight, ground crew, checklist, GPU, Fuel, Pushback, Passengers, etc . 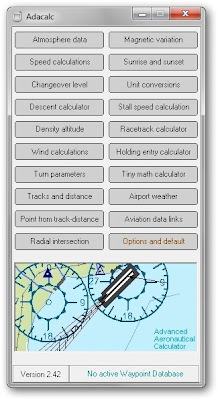 AivlaSoft has released version 1.30 of Electronic Flight Bag (EFB). More information and download at AivlaSoft. FSDreamTeam has posted another preview video of Ground Services X "Catering" on YouTube. Navigraph NAVData AIRAC Cycle 1103 is now available for purchase at Navigraph or SimMarket. 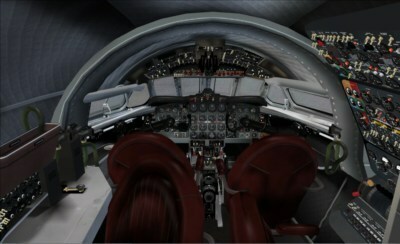 Just Flight has posted the first development screenshots from the upcoming Comet Professional for FSX. - Another Bill Womack masterpiece! 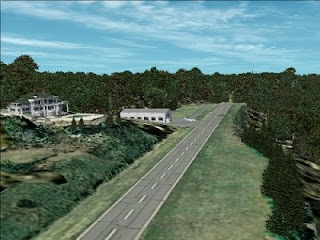 Walter Roberts has released JY43 Hill Top Airport NJ for FSX with sloping runway. Download it at AVSIM. "I was flying around the FSX world looking for a real world sloping airstrip just begging to be modeled with a touchdown tire squealing, smoking rubber - that kind of hardened surface sloping runway after I finally figured out how to persuade the FSX SDK to compile one. The Airfield Candidate shall have high density LiDAR elevation and high resolution Orthoimagery data available for public download. I was flying a Beechcraft Baron 58 over Wanaque Reservoir in Northeast NJ of all places when I happened upon a photo scenery runway on a sloping hill top without the usual FSX flattened airport plateau effect and FSX textured runway. They have missed this one ! Hello JY43. 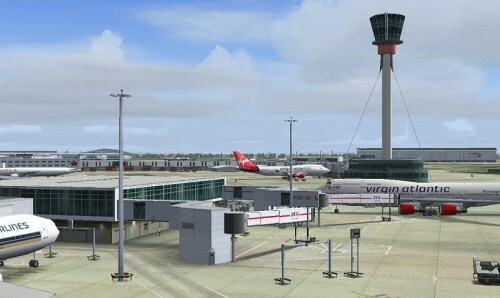 - Wally-Bob"
Gary Summons has released demo versions of his outstanding Heathrow Xtreme V2 scenery for FSX and FS2004. 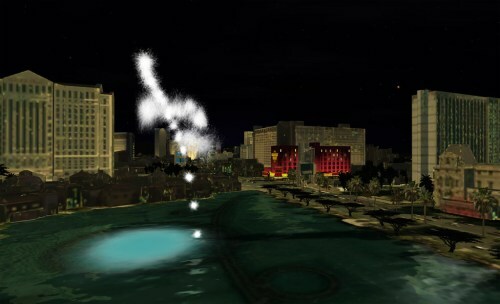 Mathijs Kok has posted a preview screenshot of the night textures for their US Cities Las Vegas screnery for FSX. 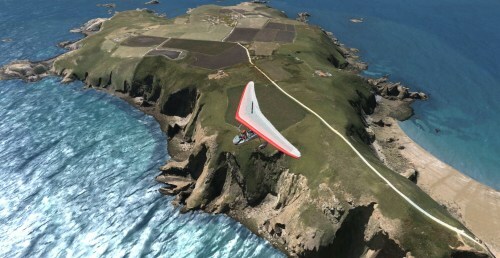 Earth Simulations has posted preview screenshots of their upcoming The Channel Isles - Guernsey scenery for FSX. 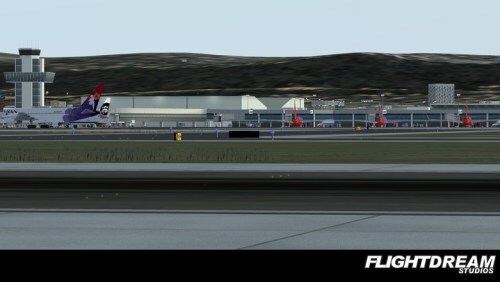 More Screenshots of FSDreamTeam Los Angeles Intl. 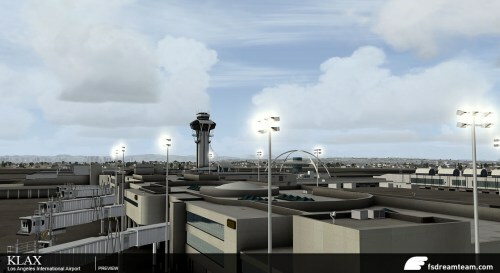 New screenshots of FSDreamTeam Los Angeles Intl. (KLAX) have been posted in the FSDreamTeam Forums. Hervé Sors has updated Adacalc to version 2.42. More information and download on the Adacalc Website. -Sunrise and sunset and twilight time values (UTC or local time) calculated from accurate NOAA algorithms. "There has been a slight modification of the scenery layer detection, and warnings about ignored layers have been "downgraded" to informational messages. In addition, airports with a tower altitude of -1000m or less are ignored (as per user request for a very special setup). Note that the default log level has been changed, so if you're using a custom configuration file, you may need to update the LogLevel setting in autower.ini." 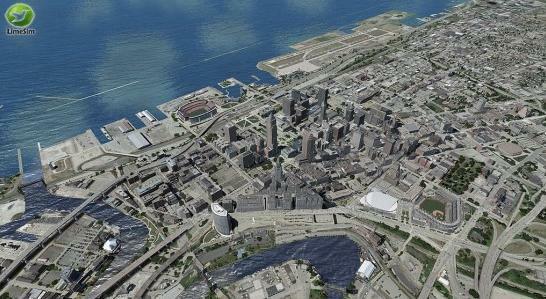 Aerosoft has released the latest product in the US Cities X series, Cleveland Ohio. More information at Aerosoft. 2. FILL IN our Contact Form with 'GUESS & WIN' as SUBJECT. The content must ONLY state your proposal (only one proposal per e-mail). X-Plane 10 "Lots of Testing, Lots of Absurdity"
Ben Supnik from Laminar Research has added a new post in the X-Plane 10 Development Blog. Mathijs Kok has posted the feature list to the upcoming Diamond DA20-100 'Katana' 4X in the Aerosoft Forums. - Wear and damage can encounter and will be stored. Fluids will be used and the aircraft can get dirty. Maintenance and services are available. Flight hours and landings will be counted and special features unlocked. - No wear and damage will be simulated. Aircraft stays clean. Flight hours and landings are not locked. No special features. Aircraft is as new every reload. Wear and damage can encounter or be triggered but will not be stored. Fluids will be used and the aircraft can get dirty. Flight hours and landings will not be counted and no special features are available. Instructor Panels are available. - Service: Replace or refill liquids, replacing or reloading battery etc. 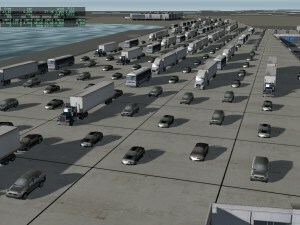 FlightDream has posted more screenshots from their upcoming Oakland X scenery for FSX in the FlightDream Forums. 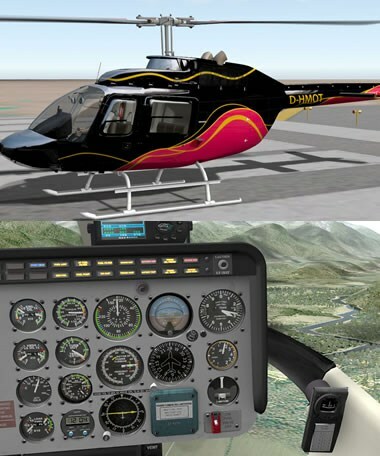 DreamFoil Creations has released the Bell 206 Jet Ranger III, now for X-Plane on both Windows and Mac. Details Here. After noticing some outdated and non-functioning links, all the posts have been checked and updated. Orbx has released Murray Island (YMUI) for FSX, more information and download in the Orbx Forums.